We are embarking tomorrow on our year’s work at the St. Gregory Academic Committee to overhaul the reporting of student learning, and one of of our foundation books is called How to Grade for Learning. As noted before, we in the academic leadership are committed to a focus on teaching and learning, and to a project of bringing all of our schooling into better alignment with enhancing student learning. Grading, bluntly, is not always an enhancement of student learning, but it is an important activity of schooling, with high stakes and high visibility, and if we are to be more serious about learning, we need to be more serious about grading for learning. True 21st century education requires revisiting the protocols of 20th century grading. 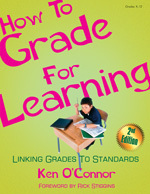 This [new] approach to grading ‘de-emphasizes traditional grades,’ demystifies the entire grading process,’ and ‘focuses on the process of learning and the progress of the individual student.’ All of these desirable characteristics occur because (1) the prime purpose of grades is recognized as communication, not competition, and (2) determining student grades is based on a pedagogy that views the teacher’s role as supporting learning and encouraging student success. use a variety of assessment methods that meet the needs of all students. match assessment methods with learning goals. Generally, this will require more use of performance assessment and clearer identification of formative assessment. with student involvement (where appropriate) develop clear criteria (rubrics) and provide models (exemplars or anchor papers) illustrating the levels of performance. Base marking on these criteria and levels. provide reteaching and reassessment opportunities. encourage assessment by self and peers– this could involve the use of portfolios, response journals, and student-involved conferencing. base grades on only the most consistent, summative, individual achievement data. When appropriate, also give consideration to more recent achievement.